The prime minister made a surprise appearance at the 'First Man' after-party. Friends Justin Trudeau and Ryan Gosling. 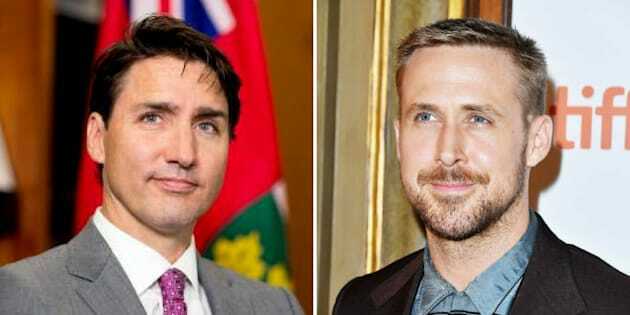 What happens when Prime Minister Justin Trudeau and movie star Ryan Gosling meet up at the Toronto International Film Festival? You get one of the most Canadian moments ever. Gosling, who's from London, Ont., attended a TIFF after-party celebrating the Canadian premiere of his film "First Man," about the life and legacy of Neil Armstrong. The event took place at Spanish restaurant Patria on Monday night, and was hosted by Nespresso and Audi Canada. Ryan Gosling and his family at the 'First Man' after-party co-hosted by Nespresso and Audi Canada. The 37-year-old star arrived sans his longtime partner Eva Mendes, and was instead accompanied by his family. Although he was only at the event for a short time, he was there long enough to be surprised by Trudeau. The prime minister attended a women's summit earlier in the day, where he spoke about the #MeToo movement and fighting sexual harassment in the workplace. He then stopped by the TIFF party to support his friend Gosling, PR company The Mint Agency reports. The two spoke for a few minutes before going their separate ways, Hello magazine confirmed. No photos of the surprise meeting were taken, but party goers who witnessed the interaction took to social media to gush about it. One even called it "the most Canadian thing I'll ever see." tonight I cooked for Ryan Gosling and Justin Trudeau. Seeing them talk on the patio at work might have been the most Canadian thing I'll ever see. The only thing that would have made this TIFF moment even more Canadian is if Justin Bieber or Drake showed up to give a special musical performance. In addition to Gosling and Trudeau, party guests included "First Man" cast members Claire Foy, Pablo Schreiber, Corey Stoll, Brian d'Arcy James and director Damien Chazelle. Ryan Gosling attends the 'First Man' premiere at TIFF on Sept. 10, 2018. Gosling is no stranger to TIFF. The last time he attended the festival was in 2016, when his film "La La Land" — which was also directed by Chazelle — had its Canadian premiere. At that time, the 37-year-old noted how nice it felt to be home. "It's great to come home, period. I don't get to come home enough," he told Celebrity Wire News. "And it feels good to be able to bring something, so I'm happy to be bringing this film."